Fall grasps the street in a ginger hug, my feet navigating the raised pavement of my newly appointed neighborhood. The leaves get a shake down, suspended between wind and gravity, but I hear nothing but The Best Coast, a girl who sings in a way that makes me miss California but not the California that is, but that California that was – a state I never knew personally, like that distant cousin that used to be a model for Vogue but now raises children in the English countryside. I listen to the same song over and over and over again, like I did when I was young, except then the repetition allowed for the memorization of lyrics. Every stupid lyric. Madonna. Beauty and the Beast. MC Hammer. Now, I listen to songs like taking spoonfuls of my favorite ice cream. Coffee-flavored Hagen Daaz scraped with a small spoon, the carton wrapped a tea towel like my mom and I used to do, sitting on the couch and watching TV. I eat until I’m sick and swearing off cream and sugar and all of the things I don’t eat anyway. That’s what the music is like now. Lyrics are secondary to the compulsory need to enjoy enjoy enjoy. The Polish people I don’t know are always on their stoops, engaged in conversations I do not understand and sitting on unfolded lawn chairs that never go away. Judging from their omnipresence, they are most likely unemployed or enjoying early retirement in rent-controlled apartments, the owners of their buildings waiting for them to die out so that they can ship in rich kids willing to gentrify the neighborhood. But until then, it’s like being on the set of Cheers, where everybody knows your name but they never know mine. A girl with red hair and red eyebrows walks towards me, holding a bag of groceries and accompanied by a scruffy boy who reminds me of what my ex and I looked like together. Weird and good and dying by the minute. The vision makes me happy and sad, like being downwind of a stranger wearing the cologne of that same ex, the memory becoming real and ever-present in its familiarity until I remember that he’s not mine anymore and now I’m just another girl who gets to keep the memory of the perfume, but not the boy himself. Puerto Ricans stand next to the bodega on Manhattan where I bought my movers a tall can of Coors Light two weeks ago. They drank all day, my movers. One rolled a joint halfway through while sitting on top of an upturned bucket in the back of a crumbling cargo van as we traveled over the Williamsburg Bridge. He called me Jen, which only my Nana ever did, while she was still alive and talking to me, her English inflection holding onto the end of a single-syllable abbreviation of my name like the linguistic equivalent of hanging up a coat. I did not correct him. I did not tell him about my Nana or how she cut us out of her will or my subsequent dislike of the name “Jen”. I listened to him talk about accidents on four-wheelers and blood coming out of broken skin. When it was over, I tipped them $20 even though they were lazy and didn’t deserve much of anything except a tall can of Coors Light. I walk down to the subway that I have just missed like I always miss. I chase the runaway train for my own gratification of frustration – the “G” symbol swathed in green disappearing down the tunnel like I’ve just thrown a ridiculous coin from a country that doesn’t exist down a well and then changed my mind. Before I moved here I was nervous about the separation from Manhattan. The word “commute” recalling countless hours wasted in a car on a freeway somewhere between Orange County and Los Angeles, grinding my teeth and banging the steering wheel with my big hands, shutting off my music so as to not hate it later by negative association. Here, though, here I read. I read books that have been sitting in the space underneath my bedside table for months, collecting dust and shame. My subterranean life happily passes into the hands of an author with envious prose. The train arrives. The door closes and my tin chariot shudders, the black landscape smearing against dirty glass like a disgusting jam that no one would ever want to eat. A man in front of me sports a bruised eye and holds a pair of soccer cleats in a size that I used to wear in middle school, petite and reasonably proportioned. At the next stop, a boy arrives through the door on my right. He sits next to me and I pretend to read the words on the page of my book, but instead take the time to fall in love for a moment with a stranger. Though instead of looking him in the eye and professing my strange and untoward feelings, I watch him pick lint off of the surface of his Cheap Mondays. I admire the soles of his shoes (strangely orthopedic) and notice the way he crosses his legs. I even forgive him when he rubs the sleep out of his eyes, his fingers moving vigorously underneath his glasses and then rubbing together again somewhere by his knees, ridding themselves of any findings. He gets off at the next stop. I never see his face, only the back of sandy blonde hair and his shoes as he walks away. Apologies for the utter lack of posts this summer. As we, well, fall into Fall I will be cooped up and writing more because it’s cold outside and when it’s cold all I want to do is be in doors. As I don’t have a television and watching Hulu on my laptop starts to physical burn my lap after awhile, writing will have to suffice in the upcoming months. 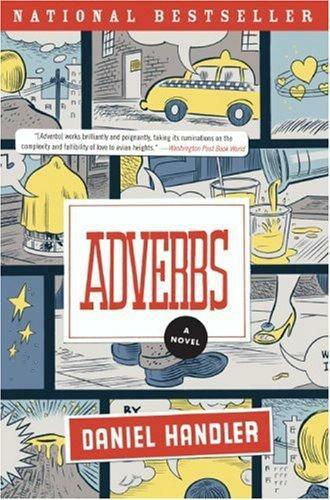 I’ve been reading a book called Adverbs by Daniel Handler. It’s incredibly special and winsome in the strangest of ways. I find myself reading it on the subway and crying at parts, not because it’s but particularly sad but perhaps hits me in familiar places that happen to be sad themselves. Anyway, here’s a wee passage from the book that I really enjoyed.